Captain Steffan is the commander of the Blades at Cloud Ruler Temple in the absence of Grand Master Jauffre. He will also tell you that the spies you must track down in the Spies quest are often seen near the rune stone down the path from the temple. Captain Steffan wears the usual set of Blade armor, including a cuirass, boots, greaves, gauntlets, and helmet. He wields an Akaviri katana. He sleeps in a brown shirt and light brown linens and carries a small sum of gold. Captain Steffan is an admirer of architecture and especially Cloud Ruler Temple: "Aye, she's a beauty, isn't she? It's hard not to admire the stonework. That's some real craftsmanship, that is." If Baurus dies (e.g. 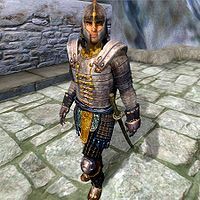 during the Defense of Bruma), Captain Steffan will take his place during the Light the Dragonfires quest. This page was last modified on 14 October 2017, at 20:42.